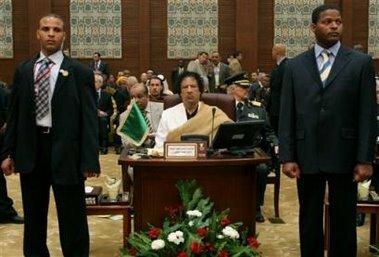 ...invited Hugh Hefner to a slumber party in honor of the 20th anniversary of Mr. Gaddafi's invention of the silk jammie. ...caused a beauty mark to spontaneously sprout on his own face through the force of his mega-will, just to clearly illustrate to Cindy Crawford that they really look much better closer to the nose. ...declared himself the world's only real pimp and warned all the other suckas out there better check themselves. 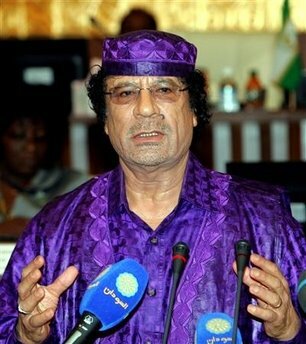 ...announced that Prince owes him royalties and 20 years of back interest for his unauthorized use of the color purple, which Gaddafi has trademarked in Libya. What a guy! Is it any wonder he needs two bodyguards, even when sitting amongst fellow Arab leaders? // posted by AbbaGav @ 3/28/2006 06:34:00 PM | | | Permalink | EmailThis!